I’m never ready for Advent. My house is a mess, I have no idea what to buy my step-father for Christmas, and my calendar feels full to bursting. I have these notions, these visions of reading Scripture and theology and poetry by the fire. But by the time I get home, I’m lucky if I read the grocery list. And yet, Advent never fails to arrive. And when it does, as it did on Sunday, I find myself swept up into the mystery of it all. Advent is, by its very nature, disruptive. It joins the hopeful, wonder-filled expectation of the Holy Child, the Word made Flesh, with the apocalyptic images and promises of the return of Christ Pantocrator, Ruler of All, Sustainer of the World. Advent calls us to examine our lives and our relationship to God and to the world. It invites us to be awake, to be attentive to God’s action in the world, and alert to signs of God’s return. Image: This image is the oldest known icon of Christ Pantocrator and is found at St. Catherine’s Monastery in Sinai. My favorite Advent hymn, Lo He Comes with Clouds Descending co-mingles images of Holy Week and the Second Coming of Christ. This is not the sweet tableau of a baby surrounded by wise men. It is the wildness of God that cannot and will not be tamed. And yet the baby is coming. Again and anew. If we allow it, Advent draws us into a liminal in between space where we recognize that God is at once doing a familiar thing, a new thing and that we are a part of. But, if I am being completely honest, I find myself wrapped up in Advent because I recognize my mortality, my earth-bound nature, my aging body, my creaking bones. Advent invites us to be curious about who we are as fragile, breakable humans in relationship to the Divine, who comes for us and to us as Love. Some years ago, at my parish in Chicago, we formed a speech choir that performed every Advent W.H. Auden’s piece For the Time Being: A Christmas Oratorio. Auden’s work is more than a simple poem. It’s designed to be spoken aloud, with chorus and solos and oftentimes in my head and heart I hear the poem as read by choruses of shepherds and magi. The line that keeps coming back to me is we who must die demand a miracle. We humans seek a miracle. We mortals are desperate for a miracle. And I don’t know about you, but I don’t even know what it is that I’m seeking. But I do know that somehow, by the grace of God, it comes to us, in holy, disruptive, untamed ways, sometimes crying in the night, like a hungry baby. For whom are you looking? All of it is wrapped up together. There is no way to Easter without walking through the denial and betrayal. And yet, the Resurrection never fails to appear, new life, changed, transformed life, meeting Mary, meeting us in that strange and holy place. I’ve been sitting with the question since Easter morning, that moment when I heard it anew–“For whom are you looking?” I wonder if Jesus doesn’t ask us the same thing. Whom are we looking for? Easter is that glorious season of seeking and finding God in the unexpected places and in unexpected, perhaps even momentarily unrecognizable faces. And that’s what I’m holding onto–that God is still dreaming, dancing, and delighting in this world, waiting for us to recognize Transformed Love in our midst. This image is from the Chapel of Mary Magdalene in the Church of the Holy Sepulcher, or the Church of the Resurrection in Jerusalem. This was one of my very favorite chapels in the space because of this sculpture. The above image is taken from http://www.sepulchre.custodia.org/default.asp?id=4115. I stand in the kitchen, my favorite red shoes in hand, they are same ones that are in the picture at the top of this site, the shoes I wore when I took my wedding vows, the shoes that have become my celebratory shoes. I look at these shoes, heels caked in dried red Georgia clay and I try to clean them. It is only the urgency of needing to wear them soon, a family wedding, that brings me to this moment. As I strip away the stray blades of grass dried deeply into the clay and mud, I wonder, how did these get so dirty? And then I remember. I remember standing in the wet grass of the churchyard burial plot. I remember my beloved leading us in the final prayers. I remember the heels of my red shoes sinking, sinking, sinking into the wet clay and grass ground, near him, though, certainly, not with him. I remember one shovel of clay dirt and another, filling in the small patch of earth made hollow to make room for what remains of him. I remember the tear-stained faces of people I love more than my words will allow me to write. I think of how much he loved us all, but especially the four of us–his wife, his son and his daughters. We huddle together, perhaps, then go inside where there will be toasts and food and small talk. People tell me meaningful and important things. Maybe I will remember a few of these gifts. I see the face of one of my parishioners, Ron, who has made the long journey from Dunwoody to Athens, and I am so struck that he has done this for me. I know that his face will forever be for me a reminder of what unexpected, undeserved kindness and love looks like. I will remember him when I next wonder if I really have time to go to that funeral. I return to my shoes. They are clean, if not new. They will do. He would appreciate the frugal nature of my salvage. He would laugh at my toenails painted a deep shade of green. He would smile and tell me how proud he is, and how very much he loves me, loves us. One year later. Much has changed, but this has not: I miss him. I miss his voice. I miss his laugh. I miss his dramatic and fiery side, that expressive face, and those eyebrows ever in motion. I miss arguing with him about God and humanity and what it all means. In the end, it’s all about love. That fierce, irrational, holy gift that is wired into each of us from the moment we begin, that spark of God that makes us wholly and complicatedly human. It’s that love that lets us hurt so damn much. Without it, of course, we would be lost, broken and utterly impoverished. And so we walk on, mud on our best shoes, broken hearts, joyfully and forever grateful for what made them break. Two weeks ago, I lived without my phone. I was on a quick trip. As the plane descended into Canada, AT&T was kind enough to inform me how much each call, text and inch of data was going to cost me in this part of the world. I tucked my phone away until I returned to the US. Without my phone and her handy apps, without Google Maps to tell me where to go, I was free to get lost. In the October of Ottawa I felt my face slapped by the chapping winds, I smelled the at once familiar and foreign scent of city life; auto exhaust and freshly baked bread and coffee. I saw the beauty of three colours of cauliflower, purple, orange and green, for sale for a dollar, fresh from the farmer who grew it. I watched busy people rushing to work and tourists walking entirely too slowly. 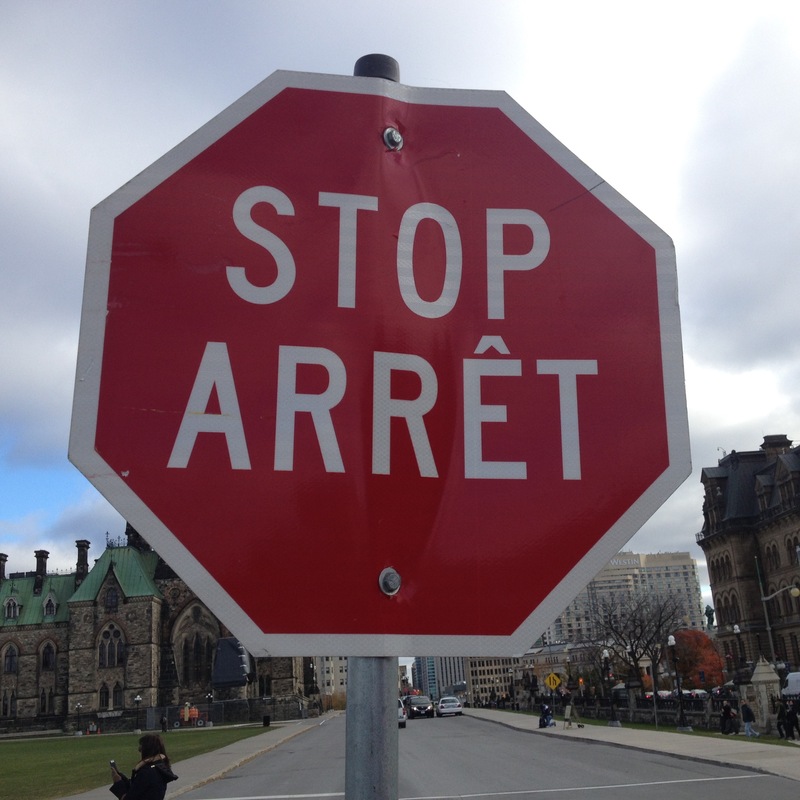 I heard languages–French, Spanish, English and so many others that I couldn’t identify. I nodded at the Jehovah’s Witnesses, who were set up on the street, smiling and talking to each other about their purification rituals. I saw the details of the Parliament Buildings and wondered about the brick layers who built the building. Who were they? What did they do on their days off? Do their descendants come and admire, decades, centuries later, their handiwork? I heard the clicking of my feet against the cement road and felt the rhythm of my steps. Returning home, I met two Georgia men. We talked about whiskey and baseball and the power of a good night of sleep. On the flight itself, I met a physical therapist from Canada who was traveling to volunteer for a week of service. I learned more about Canadian politics and living in our 2 hour conversation than a lifetime of Wikipedia articles could have given me. Photographer Eric Pickersgill has a series of photos called Removed. By removing the phones from his photos, we see how tethered we have become to our phones. His photos highlight the power they have to remove us from our real life, allowing us to sink into the oblivion of work, distraction, busyness and other. Of course, it’s not just technology that tethers us. We’re tethered by our idols–those things we think will bring us happiness, joy, escape. And sometimes they do, but sometimes they just keep us from being present. The magic of being untethered didn’t last long. I touched down four days later in Atlanta and grabbed my phone. I texted my beloved, I’m on my way home and made my way through the terminal. I have a friend who calls me at least once a week from Lake Shore Drive as she sits in traffic on her daily commute. I love the connection that the phone gives us. I am grateful for Google Maps when I am lost, or more often these days, looking for a way to dodge Atlanta traffic. Occasionally I even use my phone for work, sending out an urgent email. Most days, I wouldn’t go back to the dumb phone or even, gasp, those days before cell phones. And yet, there is something lost in our busyness and the myth of our cyber connectedness. At just a month away, the season of Advent is close. I’m thinking about the invitation Advent will bring anew, an invitation to awareness, repentance, watching and waiting. The invitation to stop. I’m wondering how, now safely at home in my regular life, I can again untether myself so that I can keep awake, watching for the promise of what is to come. I’m wondering how I will stop so that I can begin again. It was grey and overcast, the light rain noticeable, but not yet enough to send us back inside. My five-year-old companion and I stood next to the runway and watched as small planes took off and landed. One landed and drove by where we were standing. The pilot and passengers waved right at us. We both squealed with delight. The rain grew more insistent and the wind began to pick up, so we headed in. I stopped and looked back at the empty runway. My earliest memories include driving in our blue Ford LTD to the airport to pick up my sister for a summer or Christmas visit. In those days we could meet her at the gate. The arrivals were always fun–we would stop for hamburgers and milkshakes, vanilla with whipped cream and a cherry on top. I would fall asleep while she told my parents about school and books and music. But when she would go, that was a different drive. Back then, we could walk on the plane with her, watch her get fastened safely into her seat belt. Papa always brought a pack of gum, he’d give it to her before she left so her ears wouldn’t hurt. We would leave her, and the airport with its nighttime lights and zooming planes. Filling up the car with gas, Papa would run into the store to pay and emerge with a bag of salted peanuts so I could have the same thing she was eating on the plane. I cried the whole way home. Many years and marriages later, my brother began to fly. 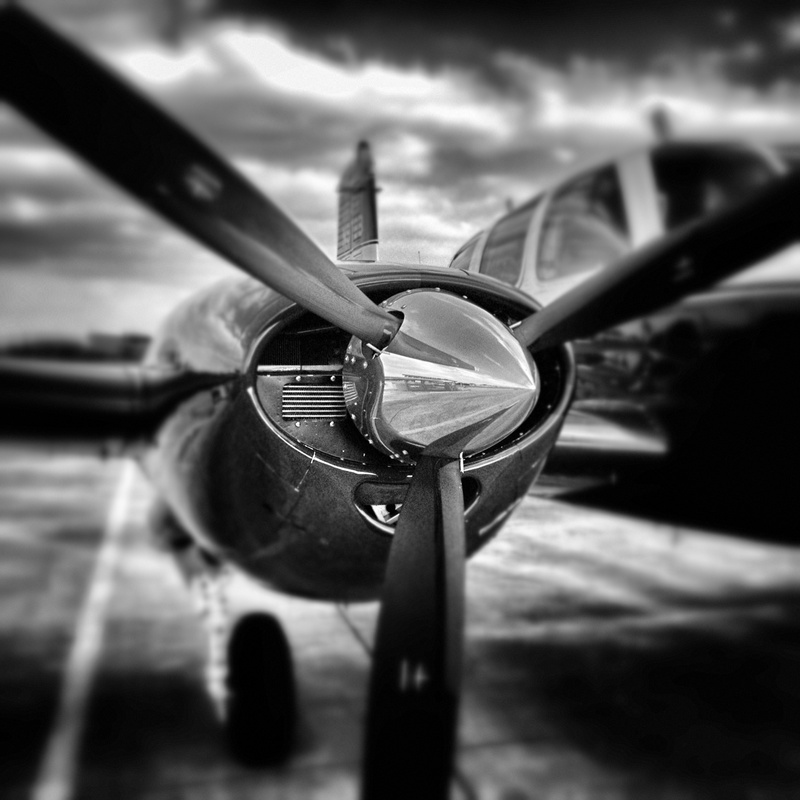 Small planes, up in the air, both terrifying and exciting my father. He was always happiest when we had found joy and for my brother, joy is often found in the air. Today, All Saints’ Day, I baptized two new lives and read the names of so many beloved dead, including my father’s. I looked out at the grey runway with planes coming and going, taking people to and from each other. It is the way we humans live. We are always coming and going from each other. Sometimes the arrivals are as dramatic and hopeful as birth, and departures as final and sorrowful as death, but often we are coming and going in how we are with the living. Sometimes fierce, sometime kind–hope and goodness, hurt and anger, messy humans making their ways. Yet even in the grey and rain, there are five-year-olds waving at us along the way, who delight in our safe journey. 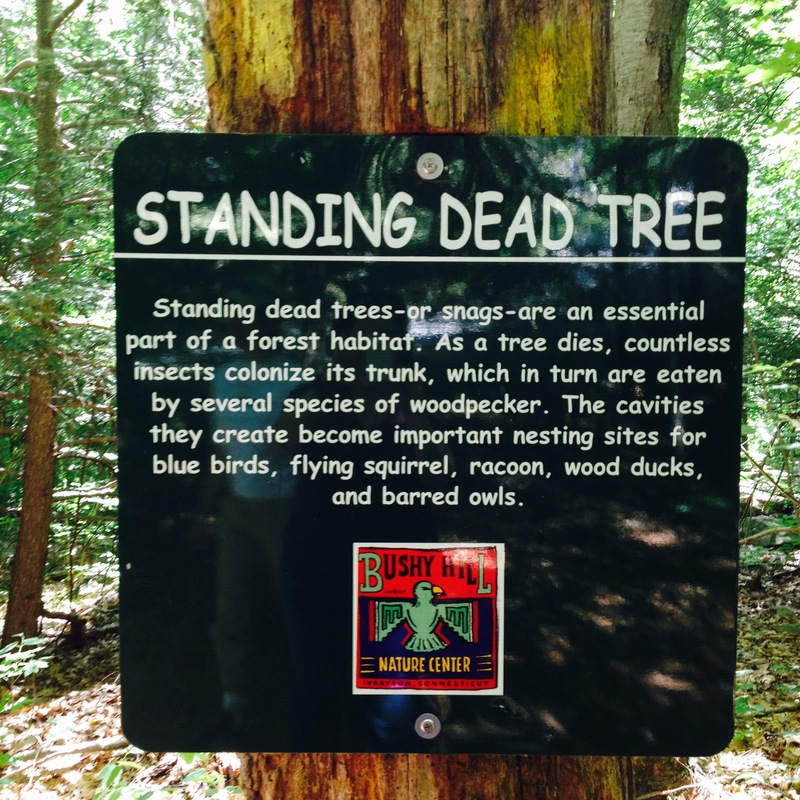 We were hiking with our niece and nephew when I found this sign: Standing Dead Tree. “Standing dead trees…are an essential part of a forest habitat.” Life grows in that which has died, a new home is made out of something that was once living. This is a form of resurrection, I think. Life, new life, coming from of that which looks dead. My favorite day, though, is All Souls, when we remember our own beloved dead. Every year I think of Victor, a man I never met, but who had such a profound impact on my mother’s life. Victor and my mama met in her acting days. He went on to become a priest in the Episcopal Church. I imagine, in some small and some larger ways, he is one of the reasons why my mama ended up bringing her new baby through the doors of the Episcopal Church. Victor is always one of my beloved dead, because, although I never met him, he helped form me, my faith and my life. On All Souls I remember my grandparents, my aunt Kay, and countless others, the list too long to post here, taking a moment to thank them, to remember them, to think about what part of them lives on in me, how, like that Standing Dead Tree, life continues, new and different, alive and vibrant. This year, of course, I will add my friend Elizabeth’s father, Dev, and my own beloved father to that list–the men who bookended our summer, the men who, in a strange way, bind an old friendship even closer, the men who, daily, are missed by so many. All Souls is about our beloved dead, our saints. We all have them. They are the ones who taught us and loved us and formed us into the people we are still becoming. We remember them, and entrust them anew, to God’s good and constant love and care. And we get glimpses of them, even though they are gone, because they remain an essential part of our habitat, giving us life, even now. 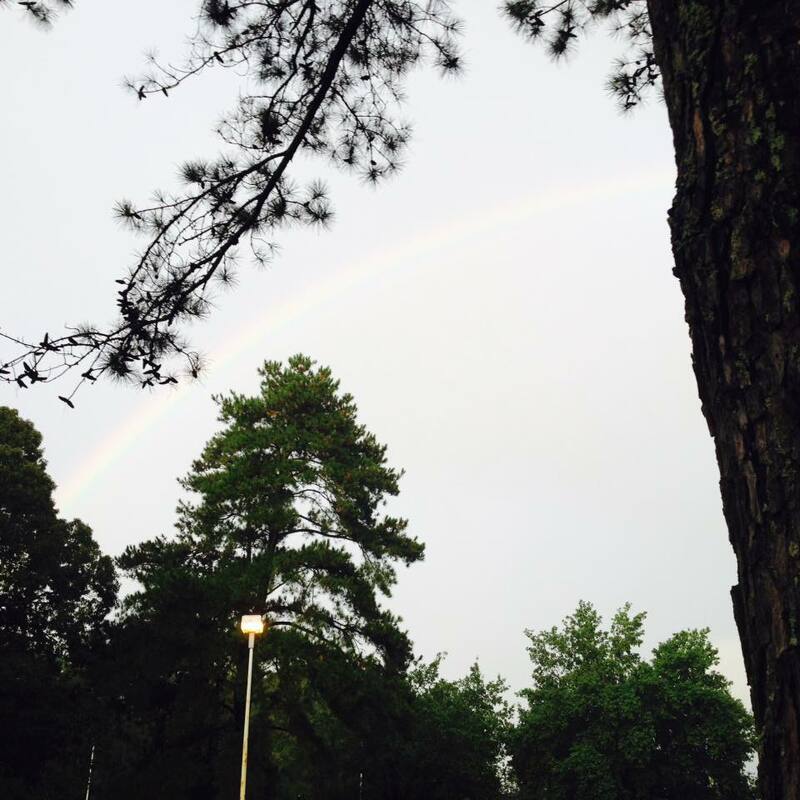 A rainbow appears over the prison where Kelly waits. I sit atop a hill, look out on the vastness of God’s good creation, mingled with human development. A pristine golf course, with lush green everywhere, the only spot of red and orange is the hint of leaves in the distance, as the begin their annual return to the earth. It is pouring and my only shelter is an umbrella, a make-shift covering on a camp chair. As I wait for golfers to come play in the rain, offering them a chance to play the “closest to the pin” hole, I bite into my favorite of all the apples, the Honey Crisp, and it doesn’t disappoint. Tonight, Kelly Gissendaner is scheduled to die. Under the shelter of my umbrella, looking at this garden of green, with the sweet, crisp taste of fall still lingering, I wonder what it was like for Eve. Did she look out and see the beauty, the hope, the new-ness of everything? Did she become disenchanted with the ordinary-ness that the garden of home became? What was she hoping to taste when she took that bite? Eden is all around. We are constantly given the gift of recreating that which has always been, and we are given the option of destroying it as well. Kelly heard the voice of the serpent over the voice of the Creator that fateful day, decades ago. Most of us have heard it too. We may not kill, but we destroy nonetheless: gossip, envy, apathy, cruelty–it abounds. Here’s what we forget. Eve was cast out of the garden, but she was not alone. Adam went with her (he was cast out too, of course). And they went on. They had a life with children and chores and Sunday dinners around the table. Grief would come into their lives again and they would survive that too. In the Rite of Christian Burial are the words “to your faithful people, O Lord, life is changed, not ended.” Eve knew that truth. Kelly knew it too. Life changed. It didn’t end. And in a prison cell, she recreated Eden. She recreated herself, becoming ever more like the One who created her. In the image of God, he created them. In the image of God, all of us are created. And we hear the serpent and we bite the apple and we are cast out of Eden. And by grace and hope, we are given the chance to recreate Eden. Not the same, but life, real life, good life. Today Kelly, now numbered with the saints in light, knows this even more fully. For to your faithful people, O Lord, life is changed, not ended. It’s true for us too. Let us remember it. Let us recreate Eden everyday.